Snap! It's a Lego app. Snap! It’s a Lego app. Anyone who has an iPhone will know that the ‘App’ store is incredibly addictive – it’s shopping for all those things that you never knew you wanted and never knew you needed. As a dedicated iPhone user I can’t help but check the App Store every so often for the latest featured applications and what’s better than finding a FREE one that keeps kids entertained?! 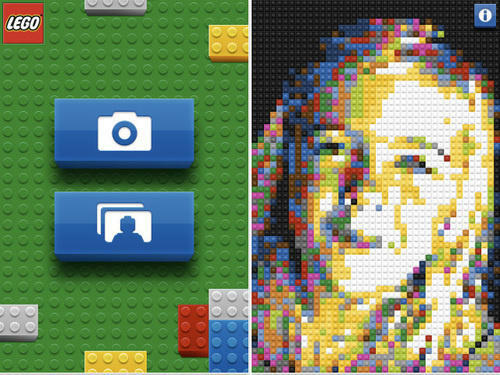 The official Lego Photo app is a simple little program that takes photos (or uses your existing photos) and turns them into Lego mosaics. Touch the image over and over to change the colour palette. Bold, clearly defined images work the best but regardless of the photo subject this is good fun for little Lego lovers. Your mosaic can be saved, so it would be tempting to print it as a template to be used to bring pictures to real Lego life. We are addicted to Lego here, check out our other Lego features. The Lego Photo app is free and available from the Apple App Store via iTunes.